When he’s not in the kitchen, Aristodemos Pavlou, the chef at Comtesse Thérèse Bistro in Aquebogue, hunts for game and forages for mushrooms, ramps and wild fiddlehead ferns. He gets duck from his neighbor, the Crescent Duck Farm, and fish from Phil Karlin, a Mattituck commercial fisherman. The twenty types of herbs he uses come from the Bistro’s own garden. Apples and cider are just a lot away at the Woodside Farms. Other ingredients come from nearby farm stands and the eleven wines available originate at Comtesse Thérèse from its own vines, for it is the Island’s only vineyard with a restaurant. 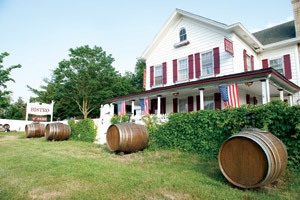 The restaurant is in an 1835 house that once served as a church rectory. It has been brought back to life by the keen eye of its owner Thérèsa (Tree) Dilworth, a tax attorney by day and a winemaker away from her lawyer duties. She spent four years converting the 180-year-old building (doing much of the construction herself) into a quaint, charming, country-style restaurant with rooms that make diners feel as though they are eating in the home of a bygone era. All of this would be unremarkable in France where lovely old homes, local ingredients, antique furnishings and very distinctive, individualistic restaurants are the rule rather than the exception. But on Long Island, Comtesse Thérèse is one of a kind. Although the restaurant’s signs, wine barrels (six of which spell out the word “bistro” in flashing neon), etc. are a bit over the top, its tasteful interior is a place of hand-gilded detail, old breakfronts holding silver and glassware, bare polished wood tables, carpeting, chandeliers, oversized framed mirrors and traditional art. Comtesse Thérèse’s French-skewed food is traditional as well. 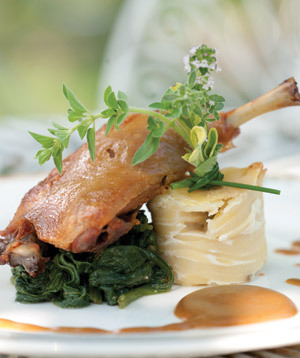 Dishes like escargots, onion soup, brie en croute, foie gras, chicken chasseur, tarte tatin and crême brulée dot the menu. Most of them are rewarding successes. And why not? Mr. Pavlou is a classically-trained French chef educated at Le Cordon Bleu L’Art Academe in Paris. After receiving some exceptional, warm, house-made rolls and soft butter, we sampled a dense French onion soup ($16) for the ages, bursting with the flavor of a local duck stock. Had it been any thicker, it could be cut with a knife. A cream of asparagus soup of the day ($7.50) offered delicate taste and consistency, but needed a hefty dose of salt. Six good, garlicky escargots ($11.75) and brie en croute, ($12) or warm brie and wild mushrooms in puff pastry paired with cool greens, are other recommended starters. Among the entrées, the fish of the day ($24), rascas, a firm white-fleshed bay fish popular in France paired stew-like with fava beans and tomatoes was light and fine. A huge take home-sized lamb shank confit ($25) was tasty but hard rather than fall-away tender. Well-done, smoked local duck breast retained its taste and most of its moisture, but would’ve been better medium rare (our competent waiter didn’t ask how we wanted it). Sautéed chicken ($23), in a rich cream sauce, more than passed muster. The house-made desserts here are an especially strong course. The large tarte of the day (blueberry one day) accompanied by almond cream is a steal at $7.50. The tiny tarte tatin ($9) boasts a scoop of house-made ice cream, three chocolate truffles ($10) made with wonderful Belgium chocolate are delicious and best of all is the gâteau de château ($8.50), a powerful chocolate cake drenched in warm chocolate, blackberry brandy sauce that provides chocoholics with an almost orgasmic high.